Photographic illustrations of the anatomy of the human ear, together with pathological conditions of the drum membrane and descriptive text. Philadelphia : P. Blakiston, Son, & Co., 1887. Description : iii, 4-18 p., [25 l] pl. ; ill.: 75 photos. ; 26 cm. Photographs : portfolio of 25 albumen photographs (75 figures) mounted to boards. Subject : Inner ear — Anatomical atlases. Randall was clinical professor of ear diseases, University of Pennsylvania, 1891-1924. —professor of otology, Philadelphia Polyclinic, 1888-1902. —ophthalmic and aural surgeon to Philadelphia Methodist and Children's hospitals. —elected president, Laryingology and Otology Section of the AMA, 1897. Abstract: Randall & Morse (1887), Photographic illustrations..etc. Tr. Am. Otol. Soc., vol. iv (112-116 p. & pl.). Also offprint of the abstract. Abstract illustrated by figure 68 reproduced from the atlas. 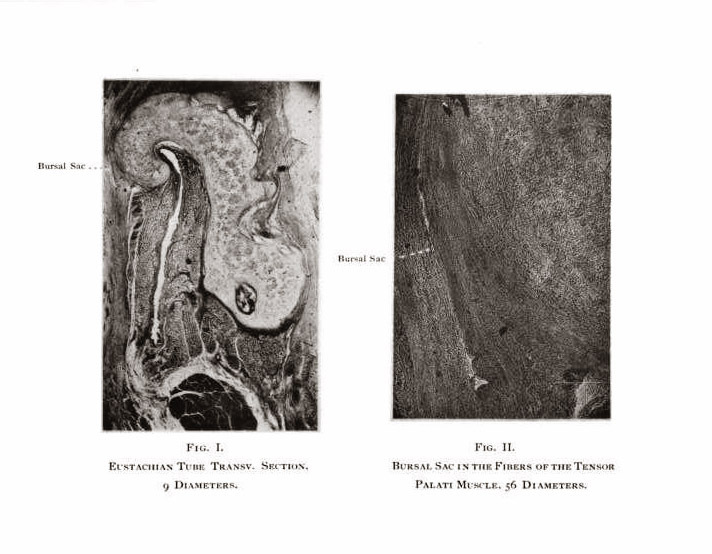 One photo reproduced in Turnbull & Weed (1888) Otology. Lond., Phila. : Univ. Med. Sci., vol. iii (pp. 187-248). Name reference: Nicolaus Rüdinger, 1832-1898. Otis archives—OHA 96 (includes Randall's paper on the corrosion method). Index Medicus: 21402891380, 20406101290, 20406121230 (abstract), 21402901010, (abstract offprint). As the essential value of photography is in its absolute accuracy they [we] have entirely abstained from retouching the negatives ; preferring that their [our] pictures should show imperfections in point of beauty, or even more serious shortcomings, rather than labor under suspicion of being warped from the truth. Some "blocking out", however, has been done, in the interest of neatness and contrast. All of the photographs were taken by the authors themselves, under varying conditions as to light, etc., as many of the specimens could not be removed from the Museum to which they belonged, and some of them had to be photographed through glass — conditions greatly increasing the difficulty of obtaining entirely satisfactory pictures. — Randall and Morse, from their abstract published in Transactions of the American Otological Society (page 113). All of the representations in the atlas are of anatomical preparations of both healthy and pathological structures of the inner ear, with legends and descriptive letterpress. The 25 photographs mounted on pasteboards include 14 photographs with 40 figures of the osseous anatomy, 4 photographs with 23 figures of the drum membrane, and 7 photographs with 12 figures of microscopic sections. For the most part, they were taken from collections created by Politzer of Vienna, Hyrtl, Charles H. Burnett of Philadelphia, and Clarence John Blake (vide intra: »»). However, Randall and Morse made a few of their own preparations following the corrosion method perfected by Dr. Nicolaus Rüdinger who used the process to create the specimens for his 1866 photographic atlas of the inner ear. The authors acknowledged their admiration of Rüdinger and considered their work an inspiration and supplement of the Rüdinger atlas. Randall and Morse also published a seven page abstract of their atlas, illustrated with the two figures shown here. A detail of Fig. 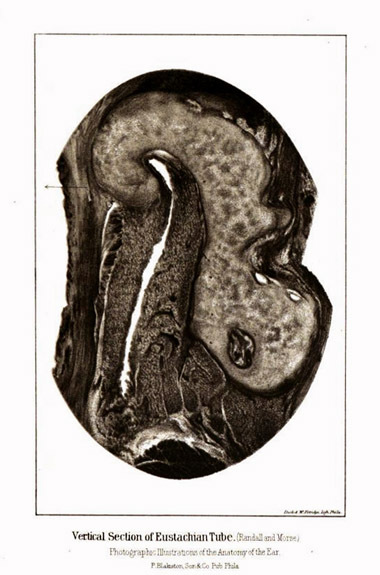 1 representing a transverse section of the Eustachian tube was enlarged and reproduced as a lithograph for Turnbull and Weed's paper on otology, published in volume iii of the Universal Medical Sciences (1888) »». Doctor Randall and the ophthalmologist George Edmund De Schweinitz (1858-1938) produced an important textbook for their combined specialties titled, An American Text-book of Diseases of the Eye, Ear, Nose and Throat (Philadephia, Saunders, 1899).